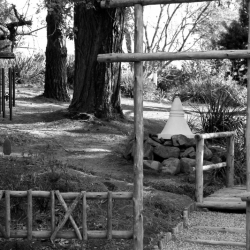 Over the many years that the Retreat Centre has been in operation, some very significant connections have been made between people visiting the place – some of which resulted in weddings. Foremost amongst them, for me, was meeting Chrisi who came, not so much to learn about Buddhist philosophy, but to watch birds…… I contrived to sit next to her at lunch – and that was that: I caught this delightful bird! We have been married for almost 30 years. Since then, other such relationships have happened there and engagements and graduations celebrated and more weddings and renewal of vows conducted. Various commemorations have taken place and ashes of dear departed distributed amongst the indigenous trees. 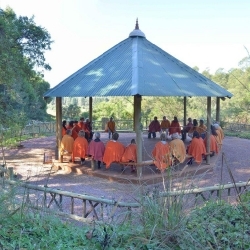 Now that we have finally completed the Buddha Boma, this beautiful addition to the BRC’s facilities is clearly an ideal venue to incorporate in such and similar events. 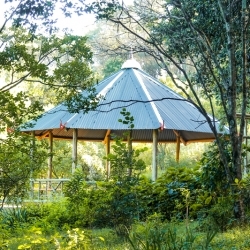 Like a typical African Boma, such as you will find in Game reserves, it is a circular enclosure set in the indigenous forest that is rapidly reaching maturity behind the Buddha statue. 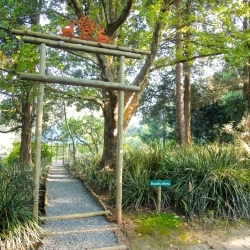 In this Buddhist oasis you will find the eight trees associated with the principal events in the Buddha’s life - from the tree under which he was born, via the Rose Apple Tree under which, as a five-year old, he had his first Enlightenment experience and the Bodhi tree under which he achieved his Enlightenment, to the Sal tree under which he died. Some of these trees were specially sourced in India. 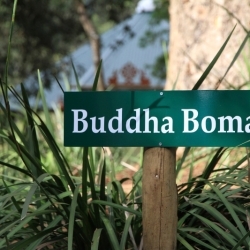 One can go on a mini Buddhist pilgrimage without leaving S.A! 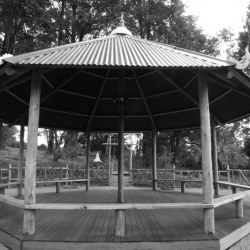 These trees surround a roofed pavilion that has seating for 25 people on benches along its perimeter. 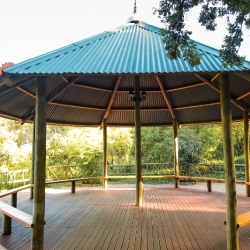 More seating can be provided by placing chairs on the raised timber deck and in the garden around the Boma. 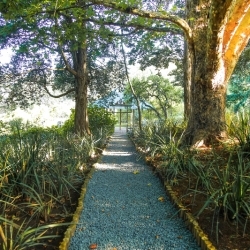 Halfway along the path leading to the Boma, is the Labyrinth, which is a wonderful feature to incorporate in any functions that are conducted in the Boma. Please contact the BRC for more information about hiring this facility for any function you may have in mind. The BRC can provide (vegetarian) catering and accommodation for 45 people. 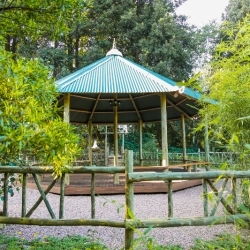 Additional guests can be accommodated in nearby B&B’s such as the Amble Inn and Kings’ Grant.